Process simplicity, organized, procedural, and extremely creative, are a few terms that reflect our work and the process on all our project. We believe that a systematic approach to design and renovation process with a big twist of creativity creates an enjoyable work flow, with less surprises saving time and money. Life is important, projects should not be life consuming. Many of our clients are seasonal residence and want to enjoy their time in their home to relax, not worry about a construction schedule. We provide a stress-free project by catching issues before they truly are issues. If you’ve been procrastinating on building your next dream home, addition or renovation give us a call so we help you move forward by doing much of the nitty gritty work for you and you can just enjoy the results! Got Questions feel free to call or to make an appointment! With thirty-four years experience, Dominic Paul Mercadante Architecture brings creativity and attention to detail to a variety of architectural and planning services. With specific emphasis on residential and light commercial design, it is the goal of this firm to find imaginative solutions that realize the client's dreams and desires, creating a building that performs well both functionally and aesthetically, that is well integrated into the landscape, and that harmonizes well within its site's context. Simple, modern home design. 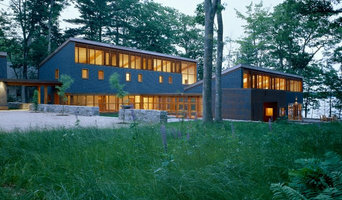 I run 30X40 Design Workshop a modern architecture practice located on Mount Desert Island. I'm inspired by agricultural structures and industrial materials, simple forms, and design born out of a narrative story. While my architecture aesthetic is outwardly simple, each project crafts a story about a specific client, in a specific time, and a specific place, using high quality materials. I find this results in a wonderfully engaging process and a more meaningful home. For more of my work, please see my website: <a rel="nofollow" target="_blank" href="http://thirtybyforty.com">http://thirtybyforty.com</a> for a portfolio of selected projects, plan sets available for purchase, my video tutorials, blog, and publication list. I'm an award-winning licensed Architect licensed in Maine with a national certification from NCARB. Since the 1989 George Gekas Design has been dedicated to modern and sustainable architecture that moves beyond predictable by creating responsive and dynamic sense of place and space, believing not only should homes be healthy and secure, but also inspiring and delightful. Challenging sites and the structures that go with them are welcomed, as are collaborative solutions for how we live, work, and dream…modern architecture pointing the way to the future. 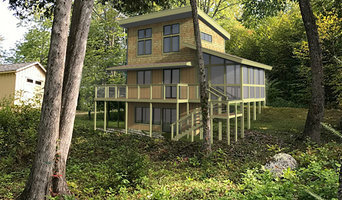 Residential Design done the Wright Way See new website: <a rel="nofollow" target="_blank" href="http://www.schildrotharchitect.net">http://www.schildrotharchitect.net</a> I work in Maine 10 months and in Florida 2 months each year. My practice is nearly all on the computer so I take my office and work with me. I have been a residential architect since 1970. Study at Taliesin the studio of Frank Lloyd Wright and at the University of Oklahoma the architecture of Bruce Goff. I have been a student of the principles of Organic Architecture through my focused interest and my practice. I offer very personal service to my clients. i work with associates located in Maine, Florida, Arizona and West Virginia. With derivation from Native American and Scandinavian languages, our name suggests devotion to an architecture at once respectful of its neighbors, reactive with its site and timeless in its design. Innovation. Collaboration. Sustainability. These are the principles which guide us through all aspects of our work, regardless of a projects scope and character. To that end we always promote: - New and better ways of building, while respecting our history. - A strong team ethic amongst the builder, client and ourselves. - Sensibility with the environment, serving future generations as well as our own. Sole proprietor licensed Architect. Spurling Design advocates fully investigating all parameters, all dreams, and all constraints to develop a wholesome design that fully adresses the needs of the occupant, while saying something about the occupant ---- producing the beautiful, functional and sublime. We recognise that buildings have character and speak to people. We appreciate structural integrity and love to show how things stand up. Spurling Design seeks out projects for the public good and the good of our environment. In 2012, Ervin Architecture was born in Bangor Maine. The impact of “wow factor” design has made positive economic and social impacts throughout Maine. Since its inception, the team at Ervin Architecture has focused on producing low-cost, energy-efficient commercial and residential solutions with extra attention placed on client satisfaction. This has led to firm that is is well-respected throughout the region. We listen. A lot. Then we listen some more. We aren’t afraid to make a lot of iterations to get even the tiniest details right. Leave the obsessing to us…because we do it well. We want to get the project 100% right for you! It’s how we sleep at night. We presently work with a team of developers, animators, renderers, estimators, and engineers to give our clients a well-rounded and complete “in-house” experience. We have over 150 years of combined experience and it shows in the ease of project delivery process. Initial consultations are always free. Call or message us today and we’d be happy to start guiding you. Let’s Build That Dream Together™. Founded by Eric Reinholdt, an award winning residential architect, 30x40 Design.Workshop designs at a variety of scales, from small renovation projects, heirloom residential projects and large vacation retreats. Eric brings a strong interest in modern regionalist design, using local materials and familiar forms + local materials juxtaposed against modern, open floor plans and minimalist detailing. See my website for a portfolio of selected projects, my video tutorials and blog. I'm a licensed Architect in Maine and I hold a national certification, NCARB. How do I find the best Verona architect for my home design project? It is best to hire a home architect who will be involved in all phases of the design process, from the initial concept to the completed construction. The architect is often the first person you will hire for your project. If necessary, they might also help you select and hire Maine subcontractors, which can include the builders, engineers and landscaper. Interior architects are also involved in negotiating contracts for all involved participants. It is for these reasons that it is extremely important for you to have a good relationship with the Verona residential architect you hire. He or she can be the tie-breaking vote between you and the general contractor and can be your biggest advocate during the construction process. Different architecture firms in Verona, ME provide different services, so the scope of the work can span from pre-design environmental impact studies to selecting furniture and finishes, depending on what your specific needs are. It is very important to hire the right professional for the job. Remember that the most well-known or established designer might not provide the best architectural services for your needs. It all comes down to the individual project. Research and ask people whose work you like for recommendations. It's important to have somewhat of an idea of the style of house architecture that you prefer, as well as the amount you would like to spend. Residential architects in Verona, ME are natural problem solvers. They will assess the entire situation and help you to solve your problems too. Don't settle for a single company too early. Call and interview a few. Make sure that you feel like your personalities will mesh well and that you like their professional perspective. Find a home architect in Verona, ME on Houzz. 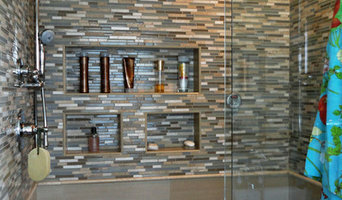 Narrow your search in the Professionals section of the website to Verona architects. You may also look through photos of Maine projects to find interior architects and building designers who have worked on a project similar to yours.